The idea is simple: Healthy, responsible prevention by ensuring all people working in Seattle have paid sick days. Staying home when you’re sick is the responsible way to prevent the spread of disease and keep us all healthy. But over 190,000 people working in Seattle – including thousands in local grocery stores, restaurants and medical centers – don’t have paid sick days. Recognizing the problem, the Seattle Coalition for a Healthy Workforce has been working with people from Seattle’s business, faith, labor, health and other communities. Together, we’ve developed a proposal that offers a responsible and flexible way to ensure people have paid sick days — helping to keep people healthy, prevent the spread of disease, and promote more productive workplaces. 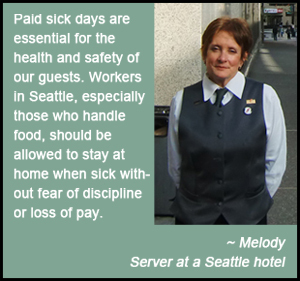 Click here to see the full list of businesses and organizations endorsing paid sick days for Seattle. For press inquiries, please contact Aaron Keating via email or (206) 529-6371.